Neutrophil cell. 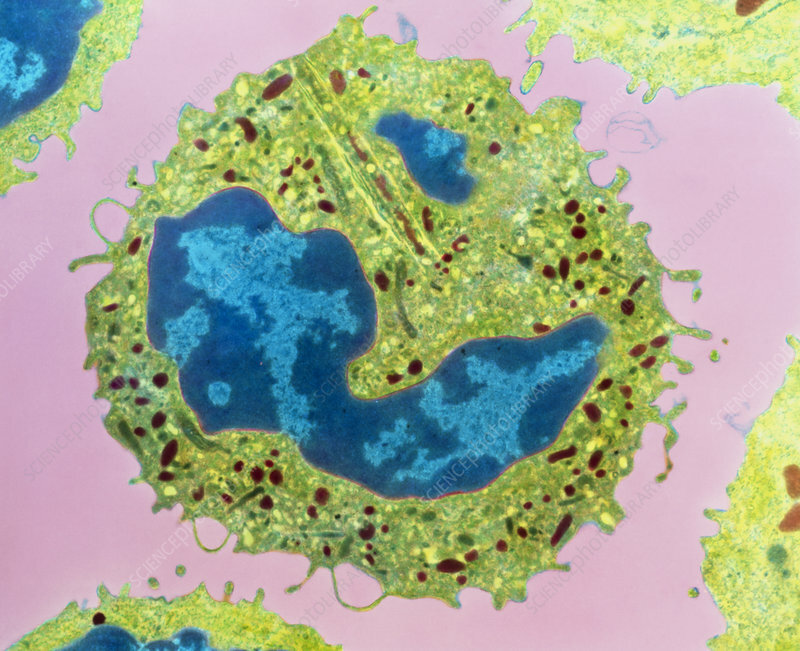 Coloured transmission electron micrograph (TEM) of a human neutrophil cell from a bone marrow culture. Neutrophils are involved in inflammatory responses to tissue damage, where they engulf and destroy microorganisms. Here, the cell's lobed nucleus (dark blue) containing chromatin (light blue) appears in two pieces due to sectioning. Within the cytoplasm (green) are numerous membrane-bound granules (brown). These contain enzymes responsible for bacterial destruction. A few mitochondria (long, green) can also be seen in the cell. Neutrophils are highly mobile and can squeeze through tiny spaces in an amoeboid manner. Magnification: unknown.